1. Merged mining with Bitcoin. The safety and reliability are ensured by strong Bitcoin computing power. Moreover, this mining strategy saves resources and avoids repeated consumption. 2. Structure of main chain and side chain. It avoids main chain being overloaded, and leads to easy routing and flexible extension, increasing the possibility for the Elastos to become basis for future Internet applications. 3. The Blockchain is a trust zone. The blockchain is a trust zone and a reliable Internet database. Smart contracts are merely the saving process of this reliable database. Only the valuable data that needs to be notarized is recorded on the blockchain; only the data processing that needs computation reliability requires smart contracts. 1. One single chain. Data transaction speed is limited by the individual node in the chain, though there are thousands of computation nodes. It is practically impossible to satisfy various needs in the future by only one chain. 2. Data redundancy and network congestion. The setting that smart contracts are exposed to DApps and all the data and code are placed on the mainchain leads to data redundancy in main storage. Now the scale of Ethereum data exceeds that of Bitcoin, while network congestions have occurred. 3. Highly coupled operation. Highly coupled with blockchain, DApps directly operate the blockchain through the Solidity script. It induces troubles in upgrade of blockchain or/and Solidity. 4. Difficulty in ecology fulfillment. 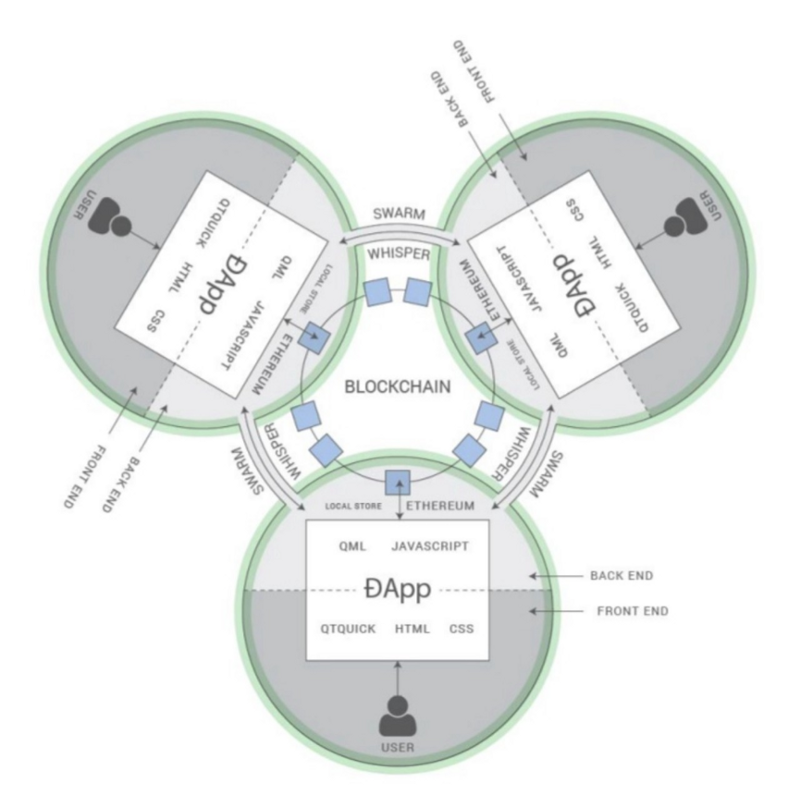 Due to the above-mentioned causes of structure design, it is difficult for the applications in the real world to be connected to DApps, while it is problematical for DApps to achieve the functions of applications in the real world. It can be found that, in the current Ethereum application ecology, there is nearly no commercialized application. 5. Data exposure risk. After obtaining data, Dapps are run at the user frontend, causing possible data exposure. PC era generated the systems including DOS and Windows95, which solved the problems of human-computer interaction and led to human productivity gains. The Internet era generated systems such as Windows 10, Android, iOS and Linux, which resolved the problems of data exchange, allowing data to flow globally. Since the beginning of the Information Age, the social wealth has been information and data, instead of traditional agricultural and industrial products. There is a growing need of an operating system fully supporting data asset transactions. The infrastructure for satisfying the needs in data asset transactions includes data asset ownership (property), network safety, and controllable environment of data running. Firstly, we need to identify the ownership of data assets, which ensures legal protection, similar to the fact that the property ownership certificate is needed for a housing transaction. Secondly, we need a safe and reliable network, free of network attacks, data tampering and identity faking, which guarantees safe data transactions. Finally, we need an environment where data can be safely processed and executed. It ensures that data processing and execution are only available to the owner. And even the owner can’t copy the data out of protection. At the same time, the environment is not only Turing complete, but also practically usable satisfying human needs of efficiency and experience. 1. We use blockchain to save data asset ownership information and execute property transactions. 2. We adopt a decentralized point-to-point network for realizing safe and reliable network communication. 3. We employ the Elastos VM for identity ownership, processing of digital assets, and to prevent data exposure. 4. Virtual machine (VM) is run on a mainstream OS. The VM functionality and efficiency depends on OS capabilities, leading to the possibility of infinite extensions. Comparisons with Ethereum: Solely relying on blockchain and smart contracts, Ethereum is not capable of achieving the above-mentioned goals, due to lack of efficiency and flexibility. The optimization of blockchain and smart contracts in Ethereum is like upgrading from Sqlite to Oracle, when end-users are trying to solve their problems on a mobile phone. 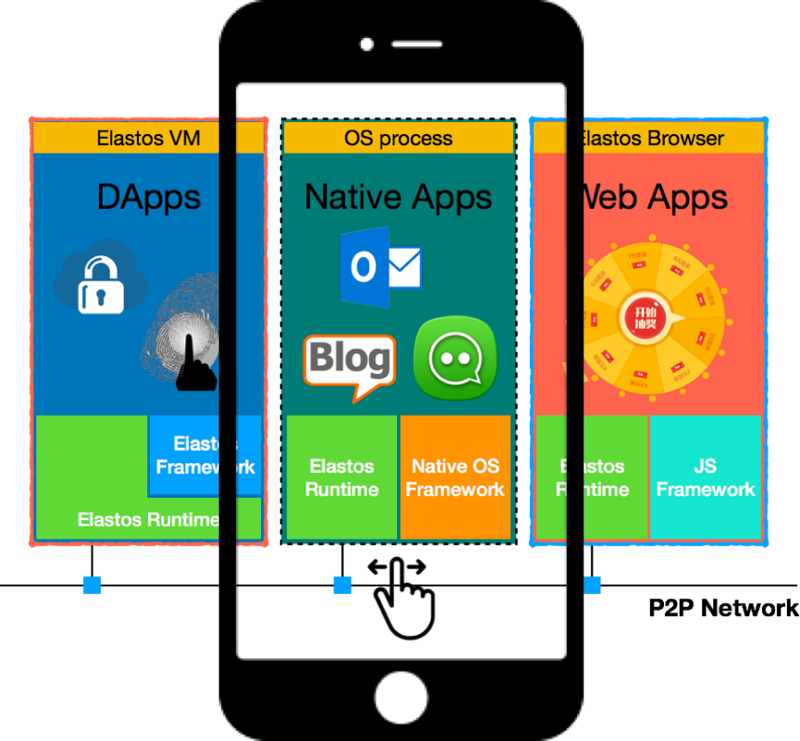 Elastos is provided in the form of a Virtual Machine (VM), Runtime and Browser. 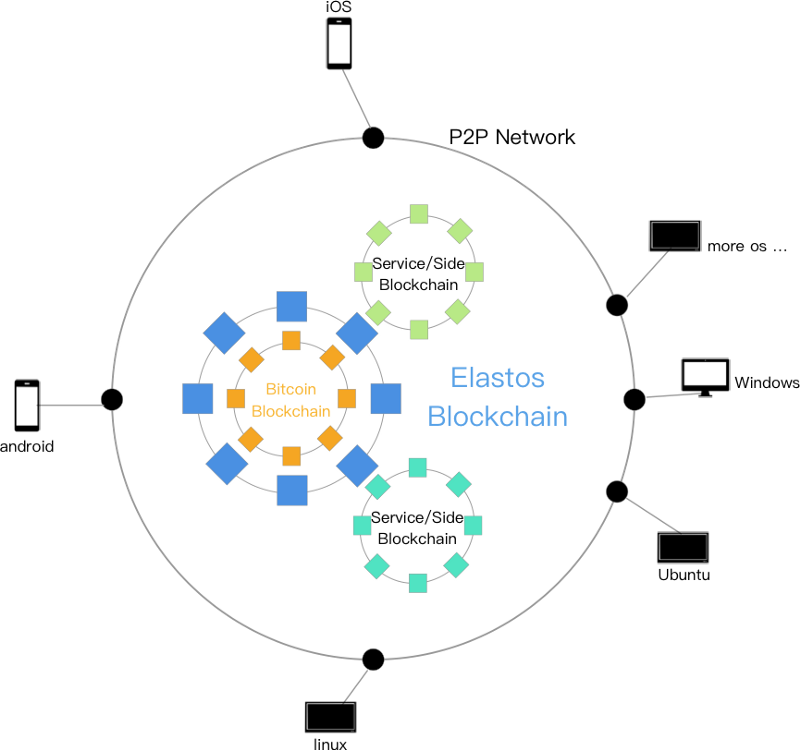 【Elastos VM】：Elastos in the form of VM based on other operating systems (OS), where the entire Elastos system is fully contained in the VM. 【Elastos Runtime】: A software library that contains some of Elastos functionality. It provides the target OS applications with needed Elastos functions, similar to the Alipay SDK serving other applications and making them capable of having payment functions. 【Elastos Browser】：A specialized browser where the Elastos Runtime is embedded. In this browser, web applications can be run with partial Elastos functions. 1. Runs on a host OS. 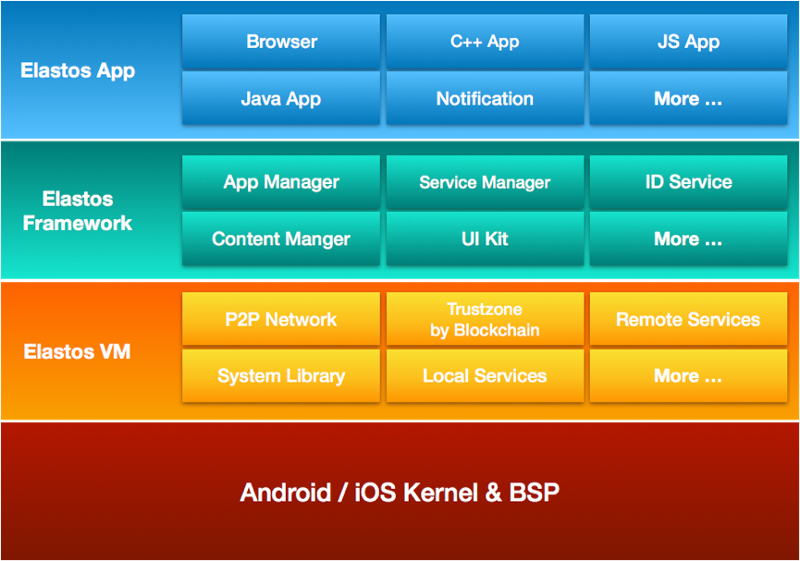 Better integration with current mainstream OS such as Android and iOS, and easier bridging with current ecology. 2. Formation of a closed runtime environment based on the Elastos VM, enabling the separation from the host OS, ensuring safety of data and code. 3. The ‘Remote Service Interface’ replaces the traditional TCP/IP programming model, providing safe and reliable network transactions. (Similar to current telephoning system, the traditional network model has the disadvantages including trash text, phone harassment, and identification faking, while the adoption of Remote Service Interface resembles WeChat chatting where the identification needs to be confirmed first, and the harassers can be blacklisted). 4. It supports the embedded blockchain service. It can provide functions including trustable identity, digital property access control and digital asset trading. 5. It adopts the Framework consistent with mainstream programming models, supporting multi-language programming, convenient for programmers to transfer code and lower their learning cost. It facilitates the growth of the ecology. 1. Similar to an embedded ‘map EDK’, it is convenient for integration with applications. 2. It can use trusted network communications, and conduct safe and reliable data exchange. 3. It allows information exchange with the blockchain, confirming digital asset ownership and identity. 1. It can be bridged to JS programming, convenient for developing various webapplications. 2. JS applications can use trusted network communications and conduct safe and reliable data exchange. 3. JS applications can conduct information exchange with the main chain, confirming digital asset ownership and identity. 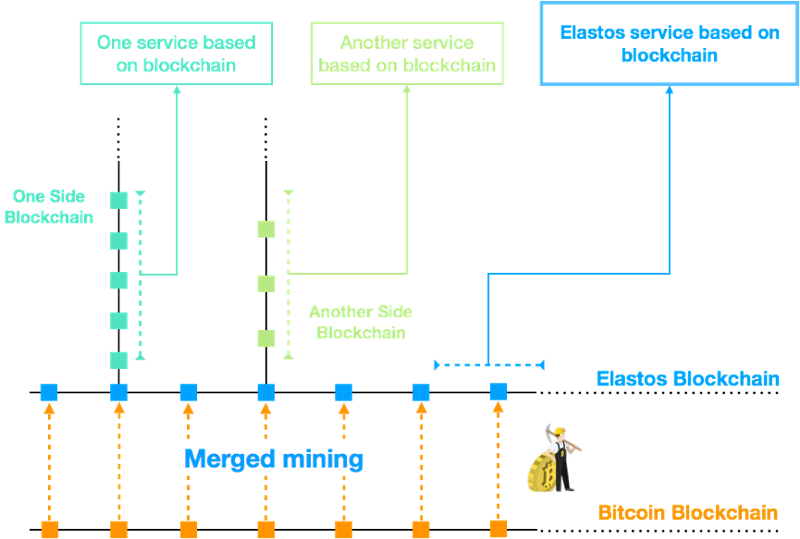 Structure of merged & multi-layer mining. It is resource-saving, computation power-ensuring, and has flexible sidechains for meeting various needs. 2. It can provide applications with trusted computation support, through point-to-point networking and communication with Elastos nodes. 3. From blockchain to Internet. 4. One system, many ecologies.